So excited that the book cover has arrived–and so thankful to the wonderful design team at Putnam and to my editor for making it so great. When I first saw it, I had a moment of pause, thinking: Oh, the disheveled hair! The drooping waistline! Now, after two+ weeks of the mini not sleeping, not eating, and not sitting still for a moment, I realize: Swap the kimono for some frayed yoga clothes, and it’s the spitting image of me–on a good day. But seriously, I’m thrilled with how seamlessly Putnam has captured both the Japan theme and the fish-out-of-water sensibility of the book. Thank you Putnam; Sara, my editor; and Rachel, my agent, for all your help and guidance during the design process! Feeling proud to have my name on such a lovely cover. Galley Pages Arrive! But I’m Unsure About the Title. The galley pages arrived today at our new house in Yokohama, where we moved a month ago. It’s so exciting to see them! But it now brings up a twist on an issue I’ve been struggling with: the title. I was thinking that we should change the title to the book before it actually comes out and hits bookstores. 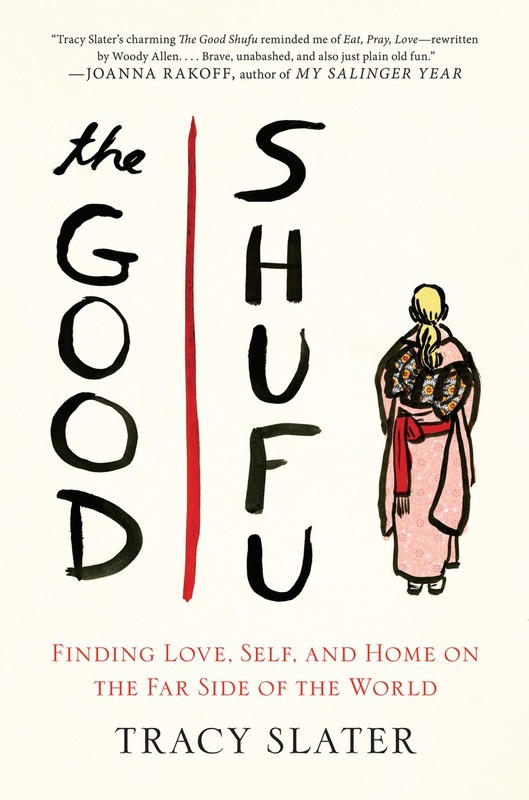 The Good Shufu seems a little too obscure to me sometimes, like, who the hell knows what a shufu is unless they’ve lived in Japan? My editor at Putnam likes the existing title but isn’t opposed to changing it, either. 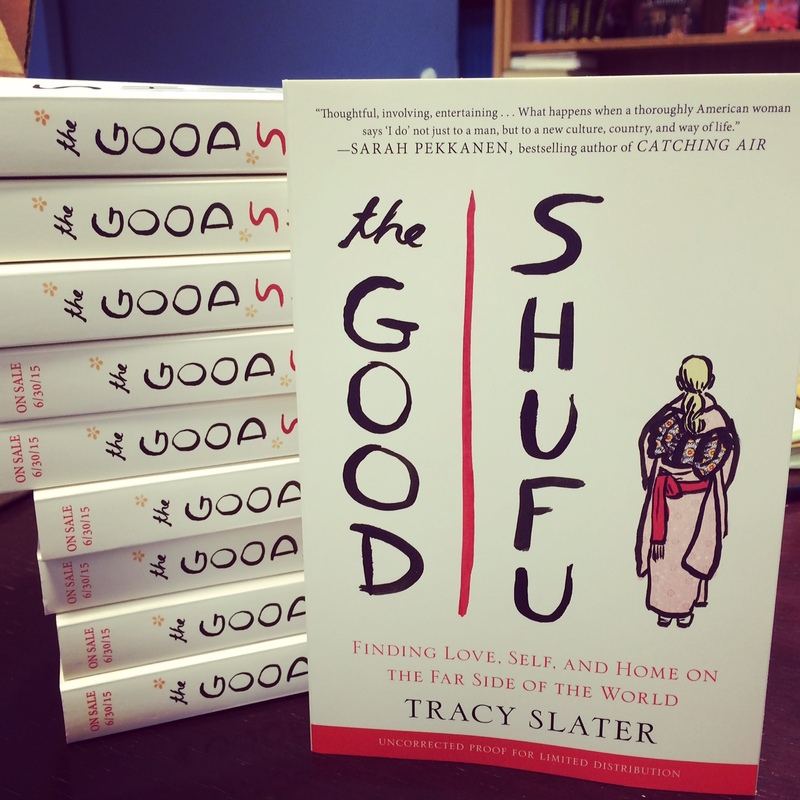 My agent and I are thinking of The Japanese Housewife, because then, with my name (which is obviously not Japanese, since I didn’t take the shogun’s name when I married him) on the cover, there will still be some sense of mystery, like how does someone named Tracy Slater become a Japanese Housewife? (which in a sense is the subtext of the whole book, anyway). Then the shogun–with his Japanese sensibility of prizing literalness and exactness above all else–weighed in, pointing out that calling me a Japanese housewife is technically not correct, since I’m not Japanese. I countered with the fact that our house is Japanese, and that part of the significance of the term housewife is that it’s sort of like being married to the actual house. But then I had the idea of using The Japan Housewife, sort of like a twist on the book title The Paris Wife. 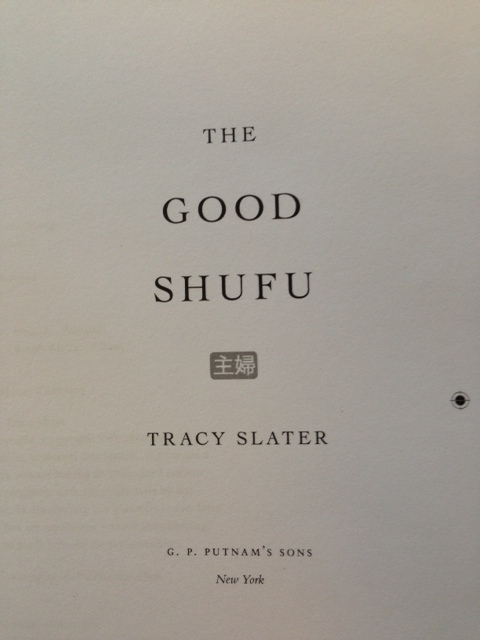 But now that I see the actual galley pages as Putnam has designed them, I’m back to kind of liking The Good Shufu again. Maybe because the galley pages actually make the book seem real after all this time, so I’m feeling attached to them exactly as they are. Anyone have any thoughts, ideas, or title preferences? But I’ve turned to the wonderful, kind, lovely, and very smart Jocelyn Eikenburg, whose blog Speaking of China has this really big following. Jocelyn has been so generous with her support and enthusiasm since we met over social media a few months ago. And, as usual, she was really generous in response to my question about how she manages to be such a social media diva. Let me tell you a secret — for a long time, I sucked at blogging and building a following. Back in 2007 and 2008, years when I labored at writing about business and China, and engaging with people on these issues, I couldn’t seem to get more than a handful of people to notice me. I felt lucky if I got even one comment or pingback in a month and didn’t know Twitter from Facebook. After all that, sometimes I can’t believe how I’ve built up a following with Speaking of China. Of course, it didn’t happen right away and it took persistence and time. But with dedication — and some direction — you just might generate a following of your own. To jumpstart your efforts, here are the ideas that have helped guide me along the way. It’s a lot harder to get noticed when what you’re offering is not that special. For example, in the China expat community, it seems like every single day a new “English teacher writes about China” blog pops up. Since this has been done seemingly thousands (if not millions) of times, these bloggers will have a tough time convincing more than just their friends and family to follow them. In marketing terms, their blogs lack a “Unique Selling Point” (or “USP”). On the other hand, if you choose a unique focus for your blog — and thus give it a USP — you’ll stand out. And a blog that stands out gets noticed and creates buzz. I did this primarily through my focus (love, family and relationships in China) and my perspective (a Western woman married to a Chinese guy). You could also give your blog a USP if you have an extraordinary voice or perspective — like a David Sedaris or Sarah Vowell. Before you start out, read through the blogs in your potential subject area — or related areas. Know the competition, so you can figure out what you can do that’s different or even better. How do you find the blogs? Try these suggestions for old-school directories, new applications and search tools. I’ll bet you know at least one person that turned her blog into a sort of random “personal diary”. One day, she’s sharing a photo of her cat in some compromising position. The next she’s ranting about annoying neighbors or giving you a blow-by-blow of her entire vacation to Disney World. The whole “I’ll post whatever floats my boat” approach won’t cut it if you want to build a following. When you move randomly from topic to topic, people don’t know what to expect from you. That means it’s a lot harder for them to decide whether you’re offering something of value to them. And if they’re not sure, they’ll move on to a better blog. This is the reason why I gave my blog an unequivocal tagline — One Western woman with a Chinese husband writes about love, family and relationships in China — which I’ve carried over to my social media presence as well. The best part about focusing? You can build yourself up as an expert and become the go-to person on that subject, which can even land you in the media (which happened to me). Remember that business/China blog I mentioned in the introduction? One of the biggest reasons I failed was something so simple, but so important — I didn’t really enjoy writing about business in China! And because I disliked it, I didn’t blog very often and even struggled to promote my work, knowing deep down it didn’t reflect my best efforts. With Speaking of China, though, I had the passion to do it from the beginning. And it grew as I focused my blog and refined my approach. It’s that passion that still keeps me posting after nearly four years. So whatever you choose to focus on, make sure your passion is there. Passion will help you create irresistible content. And with passion, you’ll continue blogging for the long haul. Readers love knowing what to expect. If you’ve defined your subject area and you’ve made it unique, you’re more than halfway there. But there’s another part of that equation — showing up on a regular basis. Yes, I’m talking about posting on a schedule that your readers will come to know and expect. Think of it from another perspective. A lot of us subscribe to magazines and we count on that content arriving at our doorstep or in our e-reader on schedule. Just imagine if the magazines just decided to only deliver their content when they felt inspired. Or worse, what if the magazines just forgot to deliver it once or twice? That’s why I think of my blog like a magazine — that my readers deserve to know when new content will come and that I should deliver on that promise. The great thing is, most blogs today allow you to schedule your content ahead of time — handy for when you’re on vacation! I post Mondays and Fridays every single week, same time and place. And when I’m on trips or just unable to post (which occasionally happens when an emergency comes up), I even run simple posts with archived content — because I always get new readers and chances are it’s new to someone out there. Every blog and social media butterfly an audience. The better you know them, the better you can tailor your content to your readers. But how to know them? Site analytics are a great place to start — which give you some information about where your visitors found your blog, how they entered your site (referral from another website? search engines?) and even popular search queries that bring traffic to you. For a wordpress.com blog like Tracy, you can study your Site Stats — built into your site. If you have a self-hosted site like mine, you can use Google Analytics. Still, if your site doesn’t generate a lot of traffic yet, you might not gain much from analytics alone. Try keyword tools like the free Google Keywords. While it’s not comprehensive, it does help you learn what people are searching on for a specific topic — which could then generate some potential ideas for future posts and keywords you could add to your content (see my paragraph below on incorporating keywords into posts for more details). Figure out where your audience hangs out — such as other blogs, forums or even groups on social media sites — and see what they’re talking about and what fires them up. Check the social media as well. For example, you can search through Twitter and Google Plus with keywords to see what people are saying on your topic. And remember, the more you blog and share over time, the more you’ll come to know your audience through comments, e-mails, and even people you interact with on social media. Okay, so your blog is something unique. You have a theme. You have passion. You’ve set a schedule. You even know your audience. But when it comes to attracting readers, you have to write for them. Let’s return to that “personal diary” blogger I mentioned above. She’s definitely not thinking about her readers when she publishes a blow-by-blow account of her vacation or complaining about neighbors. Sure, she’s random and that’s a problem. But there’s a bigger problem — no one really cares about her life when it’s presented as some navel-gazing journal. Now that doesn’t mean your own experiences can’t become great content — I blog about my experiences all the time. But the difference is, I mine my experiences for questions or truths or insights or something entertaining that might resonate with my readers. But that’s not the last word in content. See number 10 on this post on growing traffic and also Seth Godin’s post for more ideas. A lot of my traffic comes from the search engines — which means any blogger should never forget the power of search engine optimization (aka SEO). One of the most important things you can do is incorporate popular keywords and keyphrases (from your audience research) into your post titles, body content and tags. Even better, if a keyword or keyphrase lends itself to a great post, then use that as the title and pepper it into the post itself. See here for more ideas on using keywords in your posts. If you have a self-hosted blog and you use WordPress like I do, you can tap into even more SEO possibilities with plugins like my favorite, Yoast’s WordPress SEO. Everyone has a favorite method for receiving content. For me, it’s e-mail. So imagine how I feel when I discover a new blog, only to find that the author offers no option for subscribing to posts by e-mail. That’s why it’s so important to offer your content in a variety of formats — something that definitely boosts your readership. When you offer only one option — such as RSS or even just e-mail — you’re missing out on readers that prefer a different format entirely. If you have a self-hosted blog like mine, you need to know Feedburner — it’s free and when someone clicks on my RSS feed, my readers see a wealth of subscription options (including e-mail — something you must activate, but is easy to add). Liked this? Get FREE updates to new posts by RSS or E-mail. You can also follow this blog on Facebook, Twitter, and Sina Weibo/新浪微博. Thanks for reading! For wordpress.com users, you have built-in options to easily display in your sidebar — there’s e-mail, RSS and even social media widgets you can add there, inviting readers to subscribe in multiple ways. Encourage people to share your content by adding social media buttons to your posts. Some people start posts with them, others end posts with them — but I like to start and end posts with these social media buttons so readers have the option to share something they see right away or just after they’ve read it. And think about new and emerging ways for people to view your content. Nowadays, almost everyone and their cousin has a smartphone. That’s why I’m thinking about optimizing my site for those visitors. If you use wordpress.com, check to see if your theme is mobile-ready. Your fellow bloggers can actually help boost your readership just by following and interacting with them. Subscribe to blogs related to your topic — and be sure to read them and comment. Everyone loves to get comments on their site, so it definitely generates goodwill. Plus if you include your website’s link, you’re announcing your virtual presence to the blogger, who might just link back to you. Share their content on social media like Twitter and Facebook (making sure to @mention the author, where possible, and anyone else who might be interested). And don’t forget to link back to the blogs you follow, which bloggers always love! You might even go one step further like I did and divide your blogs into topics/subjects. I’ve maintained a list of every single blog written by Western women or Chinese men who are part of our community, which has positioned my site as a the place to go to find the newest blogs in neighborhood. Make a focused effort of reaching out to a few bloggers per week when they were new on the scene. If you’re emailing a more established/high traffic blog, I suggest having your post already written. Make it as easy for the blogger as possible! Put a link to your blog in your bio at the end of each guest post so people can visit your site. A lot of bloggers are happy to publish guest writers because it diversifies their content and perspective. In many cases, they’re just happy not to have to write a post themselves for a day! I’ll be honest — I am a reluctant social media user. I was late to Facebook, and late to Twitter. But one thing is certain: they have value, and the proof came in my referrals. Facebook remains my number one source for referrals from another site. [Create] a Twitter list of people you want to notice you, people who can help you get where you want to be. And this is important: it’s a private list, so only you can see it…. Now what should you do with this list? You should pull it into Hootsuite (or your preferred Twitter app or simply check it via Twitter) and use it to subtly help these people notice you…. Alexis also adds in another post that it’s important to use the @mention in your Tweets at least 90 percent of the time. For Facebook, start out by creating a page — such as a page for your blog or book or an author page. But since Likes mean everything on Facebook, how do you get people to notice and Like your site? Authormedia.com offers 10 great tips including provide value to your followers, invite friends, create shareable images, and promote offline. One thing that I’ve started to find valuable — and am trying to use more of — is tagging other influential people who you know will share the content and also influential/popular Facebook pages related to it. While I wouldn’t overuse or abuse it (such as tagging the same people/pages all the time, regardless of the content), when it makes sense to tag, be bold and go for it. For even more inspiration on Facebook, check out this post. Pinterest is also a new and emerging platform, but one that’s a lot of fun to use. You can basically post images from any site or blog to “boards” you create on Pinterest, which people can then follow. Instead of using the template boards Pinterest suggests for you, I created my own boards related to my site — including a board dedicated to showcasing photos of couples of Chinese men/Western women. But as I read this post with more tips on using Pinterest, I realize I’ve only scratched the surface of what’s possible with this platform. Sure, I have a unique and focused blog and I use social media. But I take it one step further by sharing content on social media sites with relevance to my own blog. What kind of content? Relevant blog posts from other websites, news articles, photos of couples, new books my readers might be interested in, and more. When you focus on sharing a certain type of content, people will see you as the go-to expert for this information and be more likely to follow you on social media (and even subscribe to your content). Besides subscribing to relevant blogs, I also receive Google Alerts on specific areas of interest on a daily basis. For example, when I find great news stories or blog posts or even photos embedded in blogs/articles, I share them on social media platforms. Almost every day, I stumble across yet another post with tips on building a following or a platform — and more often than not, they read like a one-size-fits-all proposition. That you MUST do what they say or else. But guess what? Not everyone can become, say, a Twitter Power User. We all have different strengths and personalities. And that means that some methods will work better for you than others. So as you work on your connections and following, don’t fret if something doesn’t feel right to you. Be honest with yourself and be willing to go in different direction, even if it means ignoring some advice (including my own). But as long as you keep trying and experimenting, believe me — you’ll find your own promotional groove, just like I did. Jocelyn Eikenburg writes about love, family and relationships in China at Speaking of China, and was published recently in the China anthology Unsavory Elements.